Parameters and variables can be specified as feedforward variables (FV), manipulated variables (MV), state variables (SV), and controlled variables (CV). These are 4 basic types of variables that are used in the APMonitor simulations. The FV and MV types are specified from the available declared parameters. These are values that are fixed in steady-state calculations. The SV and CV types are specified from the available declared variables. Fixed Values are model coefficients that change to fit process data. These parameters can change the behavior and structure of the model. A parameter is indicated as a fixed value or feedforward variable by including a line in the INFO file with an F and the variable name, separated by a comma. 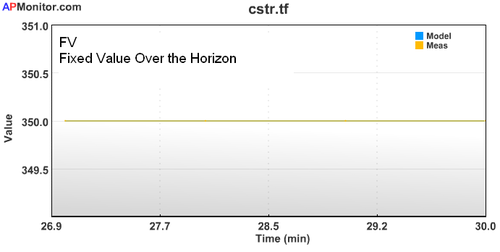 For time-varying simulations, the FVs are constant over the time horizon. Manipulated variables are decision variables for an estimator or controller. These decision variables are adjusted by the optimizer to minimize an objective function. A parameter is indicated as a manipulated variable by including a line in the INFO file with an M and the parameter name, separated by a comma. For time-varying simulations, the MVs change over the time horizon. Additional equations are added to the model for variables that have a measurement. To avoid adding these extra equations, the measurement equations are only added for those designated as Controlled Variables (CVs). State Variables (SVs) are those variables which may be monitored but are not measured. States are model variables that may be measured or are of special interest for observation. A variable is indicated as a state by including a line in the INFO file with an S and the variable name, separated by a comma. 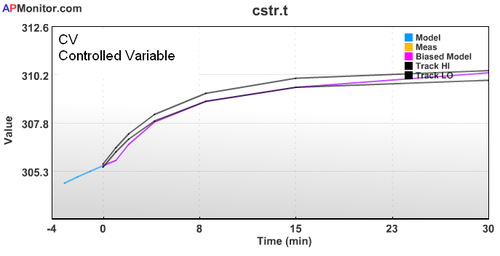 For time-varying simulations, the SVs change over the time horizon. 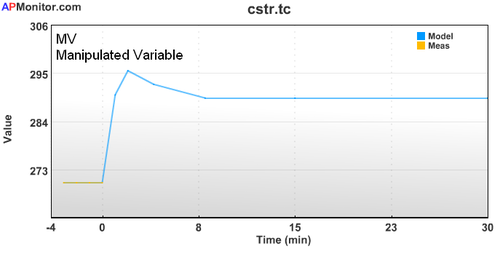 Controlled variables are model variables that are included in the objective of a controller or optimizer. These variables are controlled to a range, maximized, or minimized. 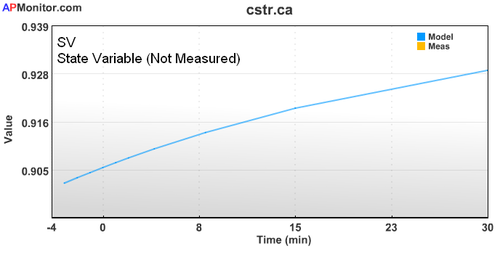 Controlled variables may also be measured values that are included for data reconciliation. A variable is indicated as controlled by including a line in the INFO file with a C and the variable name, separated by a comma. For time-varying simulations, the CVs change over the time horizon. Every time a model simulation is executed, the INFO file is re-written. The parameters and variables are rearranged into the order that they appear in the model file. They are also given a number and non-existent parameters or variables are eliminated from the list. Link variables to Info_FV, Info_MV, Info_SV, or Info_CV objects in the APM model file. Select variable classifications from the web interface.